A high-durability material more resistant to hard use. Engagement is similar to organic, but may glaze slightly in stop-and-go traffic, resulting in slippage until worn clean when used hard again. Higher temp range in general, but can be ruined from overheating - will not return to original characteristics if "cooked". Has a break-in period of 500 miles during which slippage may occur. Care must be taken during this period not to overheat from excessive slipping. Material is uniform yellow/green and may look slightly fuzzy when new. Will take hard use, intolerant of abuse (will overheat and not recover completely). 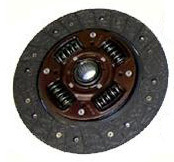 Used on Stage 1 and Stage 2 clutches. Due to the unforgiving nature of Kevlar, it is not recommended for street cars, especially those that see frequent stop-and-go traffic which will cause surface glazing of the clutch. 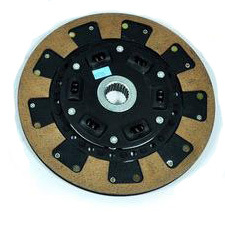 Very high temperature materials, usually only found on Stage 3 and Stage 4 multi-puck Discs. Will accommodate high HP Engagement is more abrupt. Will wear flywheel surface faster, especially in traffic situations. Carbon is slightly more durable and flywheel-friendly, ceramic has a higher temp range. Multi-puck design may result in slight shuddering or "stepped" engagement when used in traffic situations, although many users report completely acceptable operation. Street/strip applications for drag-racing and heavy track use cars up to 500hp. Will take very hard use, suitable for extreme-clamping applications. Same material and characteristics as solid kevlar, but segmented (blocks or sections missing) for better heat dissipation. New generation of kevlaris resistant to glazing and is an excellent choice for smooth operation in high-powered cars or those equipped with SMG transmissions. Ideal for street-driven track cars up to 650hp, auto-x, and heavy track use. Chromoly is a high carbon steel. Very tough and lightweight, much more so than aluminum. It's also more expensive. It has very desirable properties for a flywheel.